You are here: Home / What Type of Cheap Front Door? Buying a Cheap Front Door. This may sound like a good idea, but buying a cheap front door could cost you a lot of money in the long-run. Fitting quality products may have a higher upfront price, but they generally work better & last longer. You need to know what you are getting for your money, so make sure you ask questions about the product. If you are going for uPVC, make sure the frames are steel reinforced. The cheapest doors are likely to be softwoods or really low quality uPVC – the best will be hardwood or uPVC Composite. Always have a 5 lever mortise lock & deadbolts – many upvc doors have multi-point locking systems. 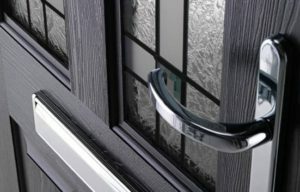 If you want a lot of glass in your front door, make sure it’s double glazed safety glass – toughened or laminated. Get quotes from at least 5 different companies – in writing.